The bear is clowning around, but the issues are serious. Some time back, I put a post on this blog about safety tethers and harnesses (https://sailingauklet.com/2014/03/23/safety-tethers/ ). Following is an update on what I actually did, after all that pondering, and how it has worked out so far. 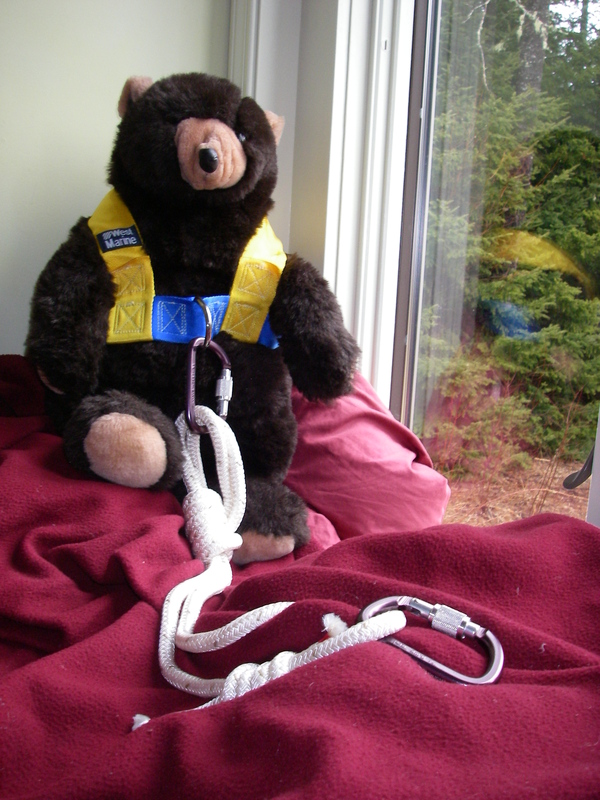 As far as the harness question, in the end I settled on a two-part approach. For time in the cockpit in rough weather, an upper body harness marketed to sailors has felt the most doable. For going forward in the kind of conditions that feel truly worrisome, I have started carrying a climbers full body harness on the boat. I chose this one, for being relatively lightweight, and for the good support across one’s back: http://www.rocknrescue.com/cgi-bin/sh000001.pl?WD=petzl%20harness%20avao%20bod&PN=Petzl-Avao-Bod-Harness.html#SID=206 (yup, it costs a fortune, and no, I’m not getting anything for including the link. But I do like this store, and they had a significant sale that took about $70 off the price.) Trying this harness on, it does indeed feel like one is extremely well supported, and much less likely to be injured by falling into it. If I were to do this again, I would get the optional opening leg straps. This would make it much easier to get into the harness while wearing foul weather gear. I had chosen not to get the opening straps because of possible added weight, added complexity, and more bits that could catch along the way on the boat; in practice, it feels like the benefits of those opening straps would outweigh the downsides. Either way, it’s a workable piece of equipment that packs relatively small, and it’s been relaxing to have it on the boat. On the tether subject, I made up two adjustable Purcell prusik tethers (see previous post on this, linked above), one somewhat shorter, one somewhat longer, out of 7/16″ braided nylon. The shorter one adjusts between about 18″ and 28″ long, and the longer one adjusts between about 22″ and 38″ long. Clipped onto a dedicated pad eye low in the cockpit, whichever one I’m using can be adjusted for wherever I will be working or resting, such that it is not possible to move beyond the edge of the boat. The longer tether has gotten more use in the cockpit, and the shorter one for trips forward, clipped to the jackline over the cabin. Technically, 7/16″ braided nylon does not have the breaking strength that one is supposed to have for this job. Thicker line seemed unwieldy, and the 7/16″ line feels strong; using it is a chance I’m willing to take, especially given that the entire point is to NOT fall a distance, creating those high loads. In this picture, you can see the very clear red stripe that shows when the lock is not fastened, and that disappears when the lock is completely closed. In thinking about the elasticity question, I looked into shock absorbers used by climbers, but when deployed in a fall, all of the ones that I found extend to at least 42 inches. On my boat, this would put me over the side, and is thus not workable. For now I’m counting on the nylon for a little bit of stretch, and am paying very close attention to adjusting the tether length for only a few inches distance-of-fall. I would like to be able to add something like a rubber connector, that would provide stretch but would be too strong to break. This could perhaps be combined with climbers’ webbing, so that after full extension and a good bit of shock-absorption, if the rubber did break the webbing would be the backup. I hope to be able to figure this out in the future. As described in the original post, the jackline is run down the top of the cabin, slightly to the starboard side, which is the side of the boat that I use for going forward. So far, this line has been rope. I never walk on the cabin top when the boat is in the water, so rolling underfoot is not an issue; otherwise, webbing would be important. I’ve been using polyester, to avoid stretch when it’s not wanted, but I’d feel better about this if I already had the stretchy section for the tether itself worked out. In actual practice, after experimenting with being tethered in more moderate conditions, I felt very aware that psychologically it contributed to “losing my edge” as far as vigilance about not falling off the boat. It actually felt safer to not use the tether in moderate conditions, and so to keep that full-time vigilance properly in order. In the end I opted for using the harness and tether only when conditions were such that I felt there was a danger of being thrown off the boat even though I was vigilant, because of wave action. Further, in those kind of more feisty conditions, it could be possible that a wave could sweep across the cockpit. In that case the tether would be far stronger than any grip one might have on the boat, and the possibility of that kind of wave became my other criterion for using a harness in the cockpit. It’s extremely rare that I go forward while underway in this boat; all the normal tasks of sailing are set up to be managed from the cockpit. But it does happen occasionally, and I’ve been quite happy to have the harness/tether arrangement in better order. It’s far more common that I am in the cockpit, and in more boisterous weather I’ve been very happy to have a workable tether that adjusts snugly to wherever I am. Recent references on the subject of tethers include the following very sad story, and resulting efforts to test tethering arrangements and retrieval of crew who are overboard while on a tether. Adjustable tethers are not mentioned; it is my fervent hope that the sailing community will start to consider adjustable tethers, inboard jacklines, and appropriately supportive harnesses. Is it safe to use a tether? Because one has to have good company, up here in the woods and all! Very educational. I hadn’t thought of an adjusting tether–great idea. I also like the idea of a carabiner. So glad it’s helpful – thanks for the feedback. Almost spring now – going to be able to start thinking about putting all this to use again! Hi Shemaya, My only thought is that you should always go forward on the windward side of the boat, i.e. the higher side with the whole boat between you and the briny deep. Being rigged so you can only go up the starboard side sounds like a mistake. I agree! I haven’t been able to figure out a good alternative for stowing the yuloh, which presently causes difficulties for moving forward on the port side. It’s possible, but the foot placement is awkward. The jackline is only slightly to starboard, to keep it off the solar panel, so is also usable from the port side. Typically I tack, if needed, to put the starboard side to windward, if something makes it necessary to go to the bow while sailing. Fortunately it’s a very rare event, going forward underway – I think I did it three times in 2015, while on the water for six months. That doesn’t count going halfway forward because I raised the anchor without putting the cap on the stove pipe! thanks for sharing. I think about tethering a lot and like the idea of an adjustable tether. How do the carabiners you use hold up to the salt water? So far so good, on the carabiners, except that I neglected to rinse them in fresh water before I put them away for the winter, and the threads on one tightened up quite a bit. That was the one that was routinely doused in salt water, when it was being used. Next time I’ll remember! The other one, that was at the harness end, is completely fine. I’m not sure what this would mean for long-distance passages in the salt. 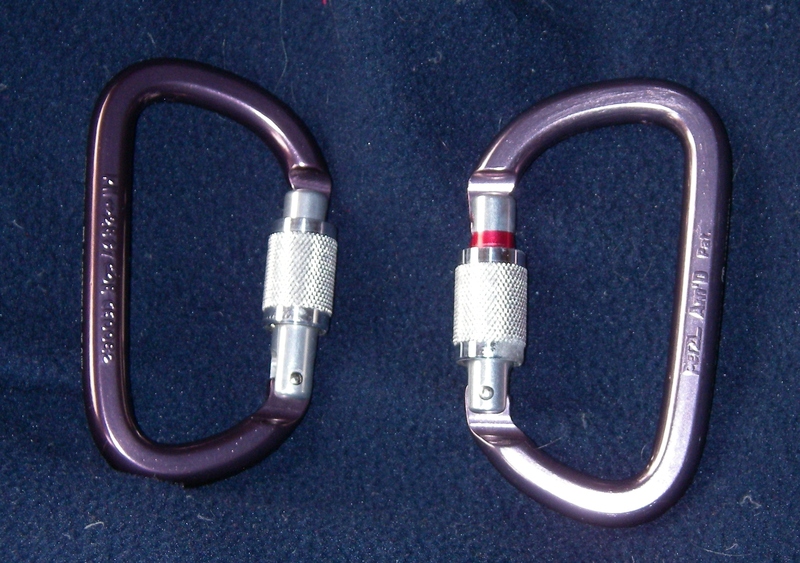 There are identical carabiners made out of stainless, available from the same sorts of climbing supply places. I started with a couple of them, but they felt very heavy… Could be that it would be best to use the aluminum one at the harness, where it makes a big difference in comfort having the lighter weight, but use the stainless one at the pad eye, where on this particular boat the waves that have splashed onto the side decks tend to drain down.